This is truly chilling. Angela Simpson tortured a man for three days before finally killing him. His crime? Apart from being white, he was a snitch. He confessed to informing on her 'sisters' - ie other ladies of similar ethnicity. She did not know any of them, but her only regret is that she did not keep her victim alive for a week instead of just torturing him for three days. She is mighty pleased with herself. Her massive ego is on display in the closing moments of this clip. A forensic psychiatrist interviews Mafia hit man Richard Kuklinski who confessed to over 200 murders, sometimes for someone 'just looking at me wrong,' or to test out a weapon, like the crossbow bolt he fired at close range into an innocent man's head after stopping and asking for directions. He is so matter of fact he could be talking about swatting flies. He once shot a man in the Adam's apple to see how long he would take to die. He placed a fifty dollar bet with his accomplice on the outcome. His nickname, The Iceman, came about from his experiments with freezing the victims bodies to disguise the time of death, although his emotionless, chilling outlook is pretty normal for a psychopath. He was also a superficially 'normal' family man whose wife and children had no idea about his profession. I was just a murderer. This is well worth watching if you want to understand the true nature of criminal psychopaths. There are interviews with Dr Hare and Paul Babiak, experts on psychopathic personalities in criminals and broader society, as well as conversations with an extreme criminal psychopath. There is also some information on early research on the brain functions related to the condition. First shown on UK TV Channel 4. Rifkin, despite his dyslexia - which clearly affected his academic performance - has an IQ of 128, putting him in the top few percentile of the population. He's probably at least as smart as Safarik, but definitely more devious. 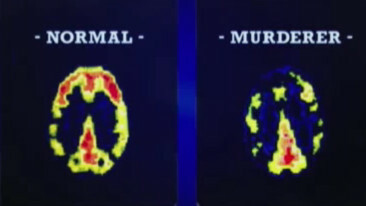 Psychopath Rifkin also agreed to have his brain scanned for the ABC Nightline documentary "Secrets of Your Mind", and you can see the results in the short clip below. Rifkin has a psychopath's brain: low activity in his pre-frontal cortex, 'the most human, thoughtful part of the brain.' As a result, he treats other people like objects, to be discarded when he's ready to dispose of them.